The second village of the island is called Keramidou, which has only eleven (11) residents and a beautiful beach. You can enjoy your swimming at the small beach of Limionas, which is located opposite the island Thimenaki. There is also built the chapel of Saint Nicholas. Psili Ammos beach is just outside Thimena village, near Saint Demetrius chapel. It differs from the others due to its fine pebbles. Ай Георгиос -пляж, расположенный в центральном поселении и привлекает множество туристов. 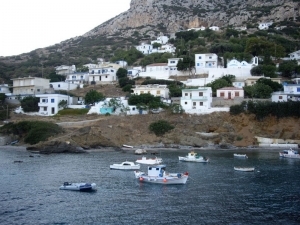 Lakkos, is a small secluded sandy beach with crystal clear, cool water.